The company was founded in 2004 by two Australian entrepreneurs, Bardia Housman and Adam Broadway. It was acquired by Adobe Systems in August 2009.
Business Catalyst's business model differs from many others in that they allow web designers to resell their hosted service as part of a "Partner Program". A reseller channel of paid "Partners" receive specialized tools for site provisioning and management, commissions on hosting fees, live training and in some instances ability to rebrand the platform as their own. Business Catalyst experimented with a direct-to-customer strategy under the “GoodBarry” brand before the offering was closed down as a part of the Adobe acquisition. Adobe BC Cafe on Linkedin is a free group aimed at letting the Business Catalyst community discuss the system outside of the Business Catalyst forum. There is also a private sub-group for Business Catalyst partners only and Adobe BC London, a regional group for BC developers based in the United Kingdom. 2004 - Business Catalyst is released as a platform designed for building and managing online businesses. 2005 - Business Catalyst launches their Dreamweaver Extension “Triangle”. An early extension to provide real-time connectivity between Dreamweaver and a hosted service. 2006 - Business Catalyst completes its Australian “Designer Success” tour officially launching its offering throughout Australia. 2007 - The company quickly gains attention with its retail "GoodBarry" brand, targeted towards do-it-yourself business owners. 2008 - Business Catalyst open their first international office in San Francisco, USA. August, 2009 - Business Catalyst is acquired by Adobe Systems, closing down the GoodBarry brand to focus solely on the web professional market. May 2012 - Adobe includes base Business Catalyst hosting as part of the Creative Cloud platform. ^ "Adobe acquires Business Catalyst". Adobe.com. Retrieved 2010-04-07. ^ a b Wauters, Robin (2009-08-31). "Adobe Buys Business Catalyst / GoodBarry". Techcrunch.com. Retrieved 2010-04-07. ^ "Adobe acquires Business Catalyst, GoodBarry | Between the Lines | ZDNet.com". Blogs.zdnet.com. Retrieved 2010-04-07. ^ "Adobe Business Catalyst - Overview". 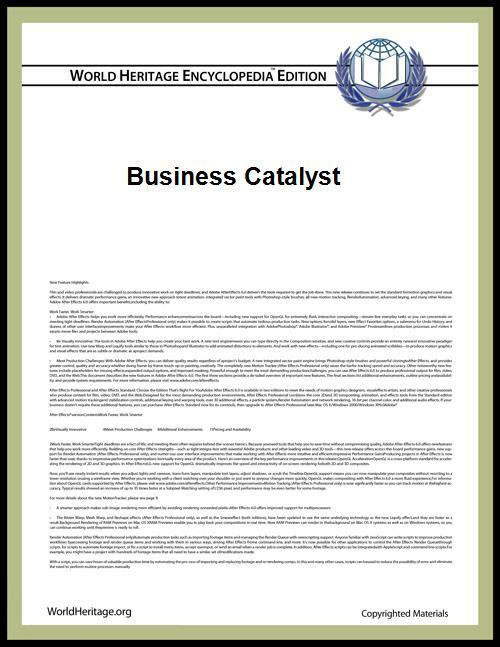 Businesscatalyst.com. Retrieved 2010-04-07. ^ a b "GoodBarry Review". Design Shack. 2008-10-17. Retrieved 2010-04-07. ^ Posted on Thu, Jan 28, 2010 (2010-01-28). "Business Catalyst CMS Review". Lyntonweb.com. Retrieved 2010-04-07. ^ Riley, Duncan (2007-10-20). "GoodBarry GoodBusiness Aims To Make Ecommerce Easier". Techcrunch.com. Retrieved 2010-04-07. ^ "Adobe Business Catalyst - About". Businesscatalyst.com. Retrieved 2010-04-07. ^ "Goodbye, GoodBarry". Goodbarry.com. Retrieved 2010-04-07. ^ "Adobe Opens New Datacenters for Business Catalyst". Business Wire. 2010-03-31. Retrieved 2010-04-07.